There are also 2 new brands at Kohepets online which I tried for my dog Lola recently and we absolutely love it. I love it for the natural ingredients, Lola loves it because.. greedy. Lol. But seriously, this stuff is tasty to her and very nutritious. This is from Absolute Holistic which is made in New Zealand. It is in line with a paleo diet. Paleo diet is a nutrient-dense whole foods diet. Basically a protein rich caveman diet without additives, preservatives, or chemicals. Cats and dogs thrive on such a diet. This treat is Made from 100% Natural whole prey (yes the whole animal, not just the organs), it doesn’t contain any grain, wheat or soy. It’s all meat! The small size makes it useful as training rewards & also a treat for finicky eaters. It seems to taste irresistible to the pooches. Oh and right now at kohepets online there’s also a launch promotion on Absolute Holistic Air Dried Dog Food. 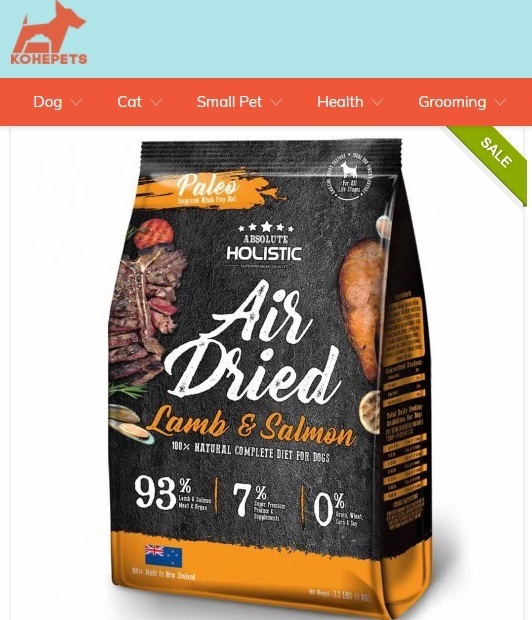 With any purchase of Absolute Holistic Air Dried Dog Food (Eg the lamb and salmon 1kg is $49.90), you get Get $20 OFF & a FREE Absolute Holistic Air Dried Dog Treats 100g . The second brand I just discovered and tried out is Orijen. It is an award winning, premium brand of pet food and treats. Lola loves the Orijen Romney Lamb Freeze Dried Dog Treats (42.5g. $16.80). It’s made from a single protein source(this particular flavour is made of 100% grass-fed Romney lamb) and is grain and carbohydrate free. The meat is gently freeze-dried in Orijen's own kitchens without cooking or preservatives, their natural, delicious goodness and freshness are locked in for a pure and tasty treat. If you want it any fresher than this, you have to freeze dry a lamb in your own kitchen! The treats are chunky and rather succulent pieces. Best part is, all natural goodness in there. Ordering from Kohepets is always a joy. So convenient, lots of promo prices and sale items. The range of pet food, treats, accessories & care products they stock is amazing (not just for dogs... but cats, birds etc too). Plus they deliver right to my doorstep within 2 days, and it's Free Delivery for orders over $60.